Magnus Angus picks one of the UK's most popular modern classic wet flies, the Pearly Whickham's as the Round One 'set fly' for this year's Fly Fishing & Fly Tying magazine's Fly Tying League Competition. We have listed a range of possible materials below but as with all fly tying the advice is to tie it in the way you think best with the materials of your choice. 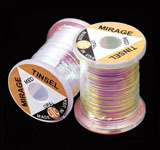 We have a massive range of alternatives available in the fly tying section of our website. Additional Details: The mirage tinsel used in this pattern may be replaced with a coloured tinsel. The wire might be silver gold or copper.